The Beautiful Boat Company are boatbuilders of distinction. We specialise in making traditional wooden craft, to order. Working closely with our clients to agree specifications, we can build to almost any design imaginable. We are the only boatbuilders/restorers based in the stunning Jurassic Coast town of Lyme Regis, and thrilled to have been nominated for a prestigious Classic Boat Award 2019. 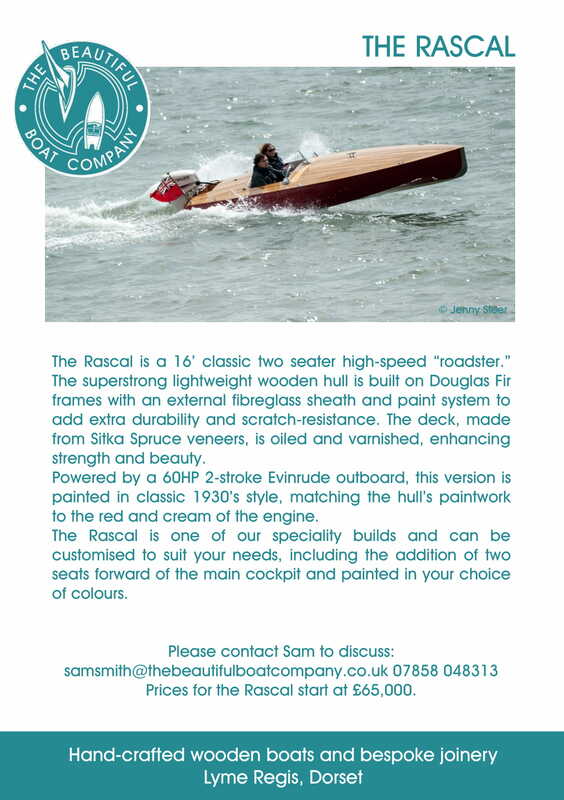 Our recent creations include the “Rascal“, a high-speed 1930’s “roadster” launch (two-seater model, can also be built to seat four) and the Beaulieu Scow, a small traditional sailing dinghy. We are delighted to have worked with Hestercombe Gardens to build a replica 1904 punt based on photographs taken more than a century ago on one of their lakes. We launched the punt at Hestercombe on Tuesday August 28th 2018, to media interest. Please see our media page for more details and video footage. Among our current builds are a 22foot coastal racing pair, to match one that is 30 years old, and restoration of an iconic 1950’s Chris Craft. Alongside commissions for new builds, we are also happy to undertake restoration, renovation and rejuvenation work as well as smaller projects inspired by the water. You dream it, we will do our very best to build it for you. Locally, we offer mobile harbourside maintenance for yachts, dinghies and other craft, helping to speed you on your way if you encounter joinery or related technical problems at sea. When time allows, we are happy to extend our joinery services to non-marine work, currently in Dorset, Devon and Somerset where we are proud to have worked on challenging projects in some of the areas finest homes.